This wireless/cordless system has both the bed pad and chair pad. When the patient lifts their weight from either pad, the alarm will sound up to 100' from the pad. Pads are made of a high quality soft vinyl, incontinence protected and feature a layer of foam for more comfort for the patient. The alarm monitor is about the size of a large coffee cup and can be easily carried about the home. The alarm features 3 volume levels and an on/off switch. The bed pad should be placed under the lower sheet in the bed, or in the chair. When the patient lifts their weight from the pad, the alarm will sound. The caregiver can take the alarm anywhere up to 100' from the pads and still receive the alarm. This system will also wake the care person at night so they can rest easy, knowing they will know the moment their patient starts to rise from their bed. This system operates on 3 C batteries, (not included) however, to reduce the amount of batteries you will use for the life of your products, you might wish to purchase an AC adapter for this alarm unit. Contact seller for details. Complete system includes 1 wireless bed alarm, 1 cordless bed sensor pad, and 1 cordless chair sensor pad. All items have a 1 year manufacturer warranty. System enables the caregiver to decide where to hear the alarm notification. Use this product for fall prevention; know when someone is getting out of a bed or chair unattended. Place the cordless bed sensor pad 30" across the width of the bed, under the fitted sheet, positioning the pad under the resident's shoulder blades for an alert when the patient is sitting up in bed. For an alert when the patient is exiting the bed, place the pad underneath their hips. The alarm will sound continuously when weight is removed from the pad. 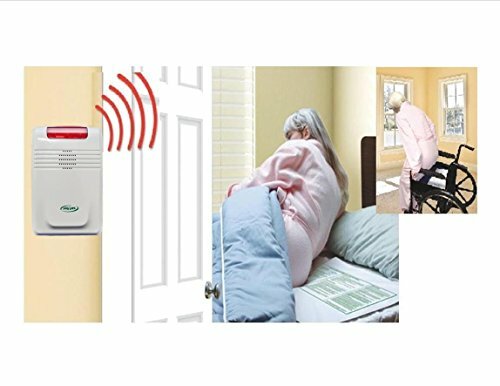 To silence the alarm, either turn the alarm off, (switch located on the side of the alarm), or reapply weight to the bed sensor pad. Place the cordless chair sensor pad on the seat of a firm chair. Alarm will sound when the resident is arising. Alarm will sound continuously when weight is removed from the pad. Silence the alarm by turning it off, or reapply weight to the chair sensor pad. The wireless alarm can be placed in a convenient location with the caregiver, up to 100 feet away from the cordless sensor pads. Alarm features adjustable volume and a gentle chime alert. The entire system is pre-programmed and ready for use upon delivery. Use 3 "C" size batteries for portability, (batteries not included). Or purchase Smart Caregiver AC Adapter model AC-04E, (sold separately). If you have any questions about this product by Smart Caregiver, contact us by completing and submitting the form below. If you are looking for a specif part number, please include it with your message.